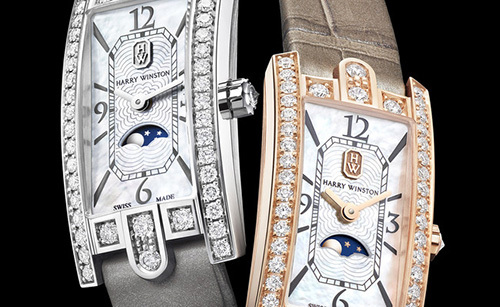 Luxury brand Harry Winston is known around the world for amazing luxury watch and jewelry pieces. They are introducing the new Avenue C Mini Moon Phase watch as part of their iconic Avenue Collection. The Harry Winston Salon is their flagship store and located on historic Fifth Avenue in New York City. The popular Avenue Collection line represents the gorgeous Art Deco period. The new Avenue C Mini Moon Phase luxury watch seamlessly fits well into the Avenue Collection. The watch features a beautiful moon phase complication. It’s also one of the smallest movements available today. The watch is quite feminine and extremely elegant. It comes available in either 18-karat white or rose gold. The watch case has a dimension of 15.6 mm x 32.3 mm. The watch dial of the Avenue C Mini Moon Phase model is made with white mother-of-pearl and 18K gold emerald applique. In total, there are 53 brilliant-cut diamonds placed. The approximate size is 0.70 carat. The watch has a Quartz Movement and uses the HW5101 caliber. Shaped like a emerald cut diamond, the minute track is stylish. At the 12 o’clock position, is the iconic Harry Winston logo in 18-karat gold. Within the minute track is group of floral motifs that are engraved. It displays a crescent-shaped aperture, for the moon phase complication. This beautiful watch is perfect for that discerning woman who wants an elegant look. With the holidays coming in a few months, it would make the ideal Christmas gift. Maybe you have an anniversary coming up? How about your wife or girlfriend’s birthday? Give her a gift she will always remember! The incredible timepiece is definitely a fashion statement. To complete the Harry Winston Avenue C Mini Moon Phase watch, it’s complimented with sharp looking, dark grey pearl alligator leather strap. You’ll find on both watch models, a new 18- karat gold ardillon buckle. It features six brilliant-cut diamonds. The folding strap clasp is made from 18-karat gold. The lady’s watch is also water resistant to 3 bars. Give the perfect gift with the new Harry Winston Avenue C Mini Moon Phase luxury watch. Follow our luxury blog for the latest fashion news and product announcements.